My husband is a saint. He lives with me, an ordained deacon, who speaks, blogs, lectures, teaches, and thinks about serving…a lot. (He would say that’s an understatement!) It’s not easy to live with someone whose calling is to serve the church when you are stuck with serving the retail masses. One appears so much holier than the other. And for those who think–subconsciously or otherwise–that ordination might just be the true path to sainthood, David would be happy to debunk that myth! But do I–the “paid holy person”–regularly affirm that his ministry is no less holy than mine? Last week David was savoring the last few minutes of his lunch break as he sat in his car, listening to some blast from the past rock & roll tune–his way of de-stressing–when he noticed a young woman walking across the parking lot toward his car. She stopped a couple of feet from the door and asked him if he could help and her boyfriend. They were on their way to another town and had run out of gas. Not the most original story and he’s no fool, but he gave her a little money and she walked away. A few minutes later as he was entering the store to return to work, he saw her sitting on the curb by the door. He walked up and asked her what she was doing and she said she was hoping someone would come out who might give her a little more money. What David had given her was not enough, she said, to get her to the neighboring town. He knew this was true. He asked if she was telling him the truth and she pointed to her boyfriend across the parking lot standing next to the car. They walked over together and the boyfriend showed him the gas gauge sitting on empty. David believed the Spirit was prompting him, so he gave enough cash to fill the tank to help them on their way. Were these people taking advantage of him? Who knows. But it was a holy moment as David responded to the Holy Spirit. Two days ago, David was in his department working when a woman came up to ask for help. As she explained what she was looking for, he realized that he was in for a long, drawn-out story–the kind that often signals a difficult customer. David’s initial inner reaction was irritation. But he sensed the Holy Spirit telling him that the task he was working on would wait, and so David listened patiently as the woman’s story unfolded. Before long, tears were sliding down her cheeks as she poured out her frustration about a contractor not finishing his job, leaving her house in disorder, and a blind daughter who had suffered many surgeries and who now couldn’t make her way around the house because nothing was in its proper place. My husband stood there in the paint department aisle in the middle of a busy day, serving this woman simply by listening compassionately. Would his supervisor have said David was wasting time? Probably. But it was a holy moment as David responded to the Holy Spirit. My husband is a saint, but it’s not because he’s married to me. It’s because he fulfills his calling to serve as he goes about his everyday life, often in the most unholy places. Ministry leaders: who needs your help in identifying the ways they live their call to serve in the everyday walking around moments of life, in the unholiest of places? Who needs to hear that the true path to sainthood is not reserved for the ordained, but rather open to all who believe in Jesus, who hear and respond to the promptings of the Holy Spirit. Encourage them to be aware of those holy moments, ready to act, ready to serve. Ready to be like Jesus. This entry was posted in Equipping, Leadership, Vocation and tagged equipping the saints, Holy Spirit, leadership, ministry leader, saint, serve, vocation. Bookmark the permalink. This is beautiful. What a wonderful way to lift up your husband, while also reminding us of the opportunities in front of each of us on any given day. Thank you, Rhonda. I know many folks consider these to be “random acts of kindness,” but I believe no act offered in Jesus’ name and for His sake is random. 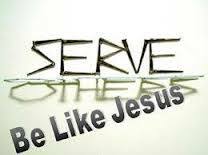 Who knows how the Holy Spirit magnifies such an act of serving in the life of the one served? That’s why I think it’s so important that all believers become aware of these promptings by the Spirit and respond, so that God’s kingdom be on earth as it is in heaven!